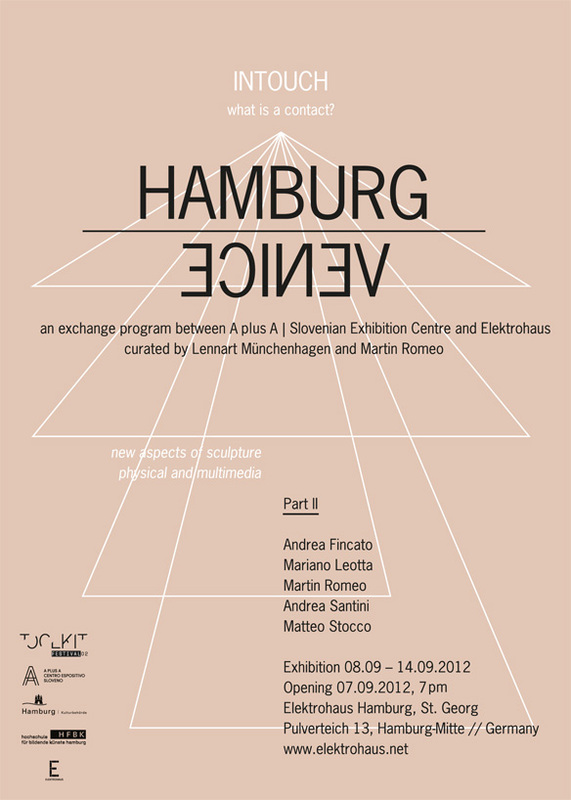 After the big success of the exhibition made by a group of artists from Hamburg, held in Venice at A Plus A Slovenian Exhibition Centre from June 13-16, 2012, it is now time for five Italian multimedia artists to fly to Germany and open the Outside Chapter exhibition at the Elektrohaus in Hamburg on September 7th. The exhibition is the second half of new curatorial project born as an art exchange between the Art Academy of Hamburg (HFBK) and A plus A Slovenian Exhibition Centre in Venice that will promote this time not Slovenian but young talented artists from Venice within a project that aims to build up a strong collaboration between the two artistic scenes of Venice and Hamburg. The artists Andrea Fincato, Mariano Leotta, Martin Romeo, Andrea Santini e Matteo Stocco, who took part at the first two editions of one of the most important multimedia art festival in Italy, Toolkit Festival, held in Venice in 2011 and 2012, will exhibit the interactive art project Outside Chapter at the Elektrohaus in Hamburg. They will explore the concept of “serendipity”, that special feeling, a happy accident or pleasant surprise of finding something good or useful while not specifically searching for it. Outside Chapter wants to investigate the use of technology in the process of making an interactive art work. The creative project and the resulting interaction between public and art works brings with it random changes, disconnected from each other, which deviate from the line established initially and take unexpected and unforeseen forms, in a sort of labyrinth structure. The final result will be exhibited in an installation to document the journey that has led to its creation. The exhibition will be accompanied by a website, created for the occasion, which will work as a database for storing the visitors’ opinions during the opening days of the exhibition and focusing on how audiences can influence the final outcome of a piece of art and the importance of such a collaboration. The process of exploring “serendipity” will be further developed in the forthcoming months with a series of exhibitions presenting each time a different approach on the same topic.